I used water soluble pencils for today’s sketch. Instead of smudging the pencil marks, I brushed water onto the paper to get different shades of gray. Like the sketch in the post from the other day, I obtained a range of tonal values. 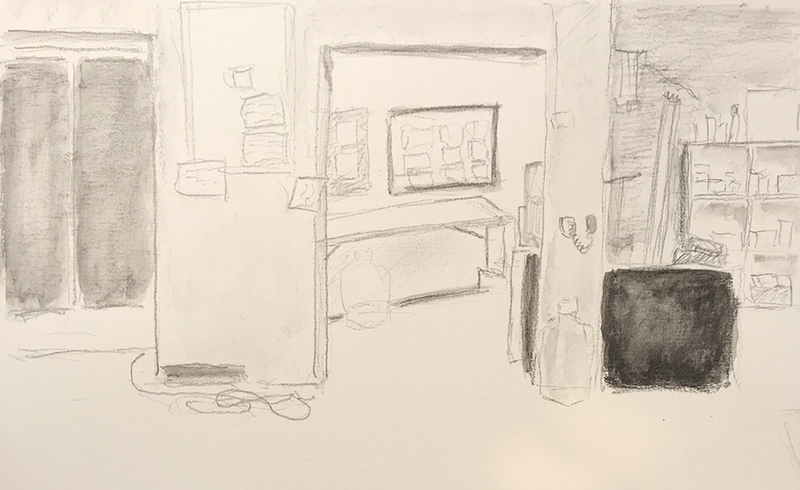 The filing cabinet (in the lower right portion of the frame) is the darkest toned shape in the scene. One’s eye is drawn to it immediately. This is not what I intended. In future pencil sketches I will strive to keep relatively low contrast between tonal values of adjacent areas. I will also choose the focal point of the composition and use higher contrasting tonal values to draw the eye there. This entry was posted in Personal Stories and tagged art, artistic process, break room, creative process, creativity, pencil sketch, tonal value, tonal values, visual art, watercolor wash. Bookmark the permalink.